Does Blogging Help SEO? That is the question. But often the answer to this question is that “I don’t have time to blog.” It’s human nature to spend our time only if we see value. Maybe you haven’t thought of how a blog could benefit your construction company. Hopefully after you read this you may rethink your marketing strategy. Not only will a blog keep your website updated, but it will also add value to your customer’s lives making them want to give you the time of day. Posting informative articles will keep your readers coming back. Your articles will also position your company as an industry leader that your customers will come to rely on you for answers. Yes. Blogging helps boost SEO quality by positioning your website’s content as relevant answers to your customers’ questions. By adding pages to your website, allows you to add relevant keywords to your site. In theory, the more content you have, the more the search engines will have to crawl and index. However, keep your reader and audience in mind. Fresh content is key! Two other reasons how a blog will help boost SEO is that it will inspire longer visits and encourage inbound links. 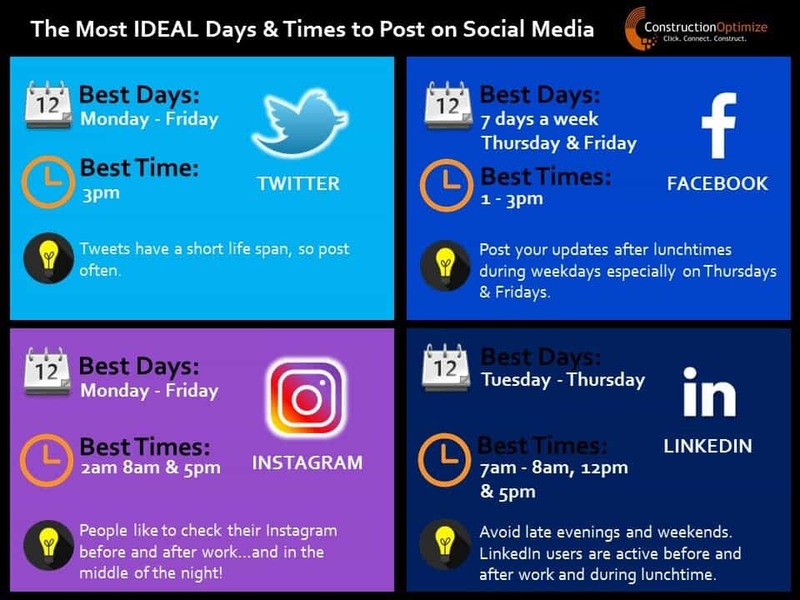 Here are the best times to post on social media. With inbound marketing, it doesn’t matter which company has the largest budget, but instead the one who offers the best answer. Believe it or not, blogging can help you obtain customers. Having a blog says that you’re “open for business”—it opens your virtual door. It shows your customers that you are an active and engaged business. Having a blog is the center of inbound marketing. A blog also educates prospective customers. Take your frequently asked questions (FAQs) and turn them into blog posts. I love this quote: “With inbound marketing, it doesn’t matter which company has the largest budget, but instead the one who offers the best answer.” Your customers will continue to turn to you for answers. So in conclusion, blogging helps SEO. Remember, the real path to better SEO performance is providing authoritative answers to the questions your target audience is asking.